Home » Transfer of property Act » Definition of Transfer of Property and essentials For valid Transfer. Q. 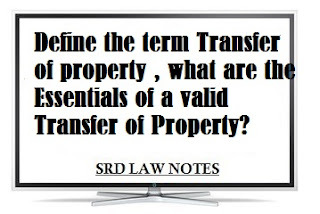 Define the term Transfer of property , what are the Essentials of a valid Transfer of Property? Transfer of Property means an act by which a living person can conveys property, in present or in future, to one or more other living persons, or to himself, or to himself and one or more or other living persons, and to transfer property is to perform such act. The object of the Transfer of Property Act is to define and amend law relating to Transfer of Property by act of parties and not to transfer by operation of law. A Transfer of Property is a contract hence all necessary requirements to constitute valid contract are to be fulfilled. The Transfer must be inter vivos. Therefore there cannot be a transfer to person not in existence at the time of transfer. The living person including company or Association or body of individuals whether incorporated or not . Property of any kind of may be transferred, excepts as otherwise mentioned in S.6(a) to (I) cannot be transferred. Therefore those properties described in the clauses (a) to(I) of Section.6 cannot be transferred. These are restrictions on the Transfer of Property and any transfer in contravention of any of the clauses given in Section 6(a) to (I) is null and void. e) the court regards it as immoral or opposed to public policy. 3) To a person legally disqualified to be a transferee. As per Section 136. of Transfer of Property Act, a Judge, a legal practitioner are an office are connected with Court of Justice are disqualified from purchasing in actionable claim. This prohibition is only with respect to actionable claim. It does not apply to any other kind of property. Every person is competent to contract and entitle to transferable property, or authorised to dispose off Transferable property not his own, is competent to transfer such a property either wholly or in part, and either absolutely or conditionally, in the circumstances to the extent and in the manner, allowed and prescribed by any law for the time being in force. According to Section 11 of the Indian Contract Act, every person is competent to contract who is the age of majority. under section.3 of the Indian majority Act,1875 a person attains majority at the age of 18 years and if a Guardian is appointed, he would attend majority at the age of 21. An insolvent and alien enemy are disqualified from contracting. A transfer by a defacto Guardian of minors property is invalid and will be hit by section 11 of Hindu minority and guardianship Act, 1956. 4) Transferor must be entitled to transferable property - or authorised to dispose off Transferable property not his own. One who is absolute owner of the property and property is free from encumbrances is capable to transfer the same. An owner of the property May authorise his power of attorney holder to transfer the property for him and on his behalf. Section 9 of Transfer of property provides that for oral transfer, A Transfer of Property may be made without writing in every case in which a writing is not expressly required by law. c) Once the Unborn person is born, he shall be given absolute interest on attending the age of majority. S.14 provides that vesting cannot be postpond beyond the life of living person or minority of unborn person. Such transfer if made is void. 1) Sadiq Ali Khan Vs. Jai kishore,1928. Privy Council observed that a deed executed by a minor was nullity. Principle of estoppel cannot be applied to a minor. A minor is not competent to transfer yet a transfer to a minor is valid . 2) Amina Bibi vs Saiyid Yousuf 1922.All. 449. A contract made by lunatic is void under section 11 of the Indian Contract Act, and so also, transfer by him of his property is void. U/s. 11 of Hindu minority and guardianship Act, 1956 a defacto guardian is merely a manager and cannot dispose off minor's property. In this case a defacto guardian sold property of a minor, the court declared the sale invalid.